Have you noticed that Google Chrome is not as fast and light as it used to be? That’s because Chrome transformed from being a simple browser into a whole Web apps platform and it’s only natural that it needs more system resources that it used to originally. But what if you’re on an older computer and can’t afford to have a memory and CPU hungry app installed? You could always switch to a lighter browser, or you can follow these steps and optimize Google Chrome for using less system resources. Even after you exist Chrome, it usually continues to run in the background, which means that it continues using RAM and CPU resources. In addition to that, having too many background apps shortens your battery life if you’re on a laptop. To prevent Chrome from running in the background, right-click on Chrome’s icon in the taskbar and uncheck “Let Google Chrome run in the background”. Browser extensions are great – they expand your browser’s functionality and let you do a lot of things right from your browser. But do you need all of the extensions you may have installed? Probably not. If your computer is short on memory and you are looking for an easy way to free up some RAM, disabling and/or uninstalling unused browser extensions is one of the first things you should do. To manage Google Chrome extensions, click on Chrome’s hamburger menu and go to “Settings”, then go to “Extensions”. Go through the list and disable/uninstall the ones you don’t need. If there are any extensions that you can’t remove the traditional way, download FileCleaner and use its browser extension cleanup tool to get rid of unwanted and malicious extensions. 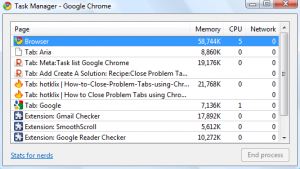 Did you know that Google Chrome has its own Task Manager? Reviewing Chrome’s running processes is a great way to identify processes, pages and add-ons that are stealing your system resources. To open Chrome’s Task Manager, click on the hamburger menu, hover over “More tools” and select “Task Manager”. There you’ll see all your tabs and pages, extensions, and background pages along with the information on how much RAM and CPU each of them uses. You can disable things right from the Task Manager. Hopefully, these tips will help you optimize Chrome for using less RAM and CPU on your PC.